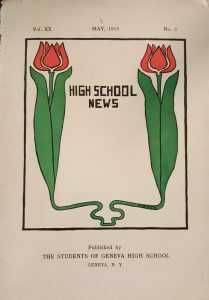 We have inferred that this newspaper might have been a predecessor to yearbooks, as they were often sub-titled as “Junior Number,” “Senior Number,” or even “Football Number.” The first Geneva High School yearbook in the Historical Society’s collection published in 1923. While looking through the publications, I found the ‘gossip’ sections to be interesting. I’ve chosen some tidbits from across all the publications. 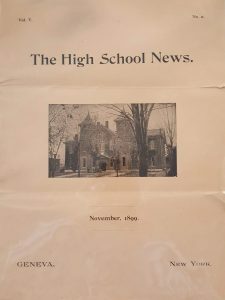 In February 1910, “Nov. 16 and 17:– ‘Red Letter’ days in G.H.S.” with a handwritten note next to it: “(boys and girls all wore red ties to make Evans mad. )” Though why it would make Evans mad, we don’t know! 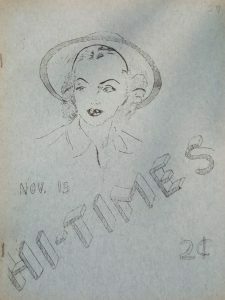 Anyone remember these publications? Were you involved in creating them?